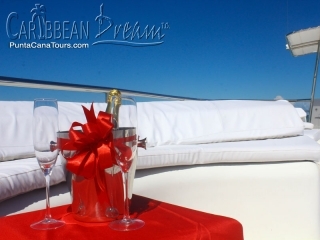 Our Punta Cana Wedding Boat has capacity for 150 persons. It is one of the very few options in Punta Cana for those groups who wish to have a sit down lunch/dinner on the water, ceremony, cocktail, reception or after party! 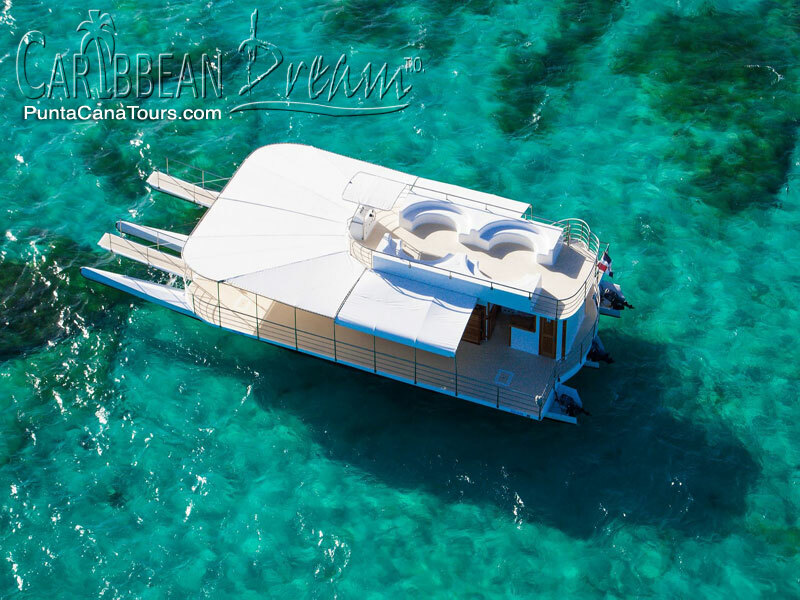 This immensely spacious trimaran is equipped with two bathrooms, a full kitchen, upstairs lounge area and seating area. 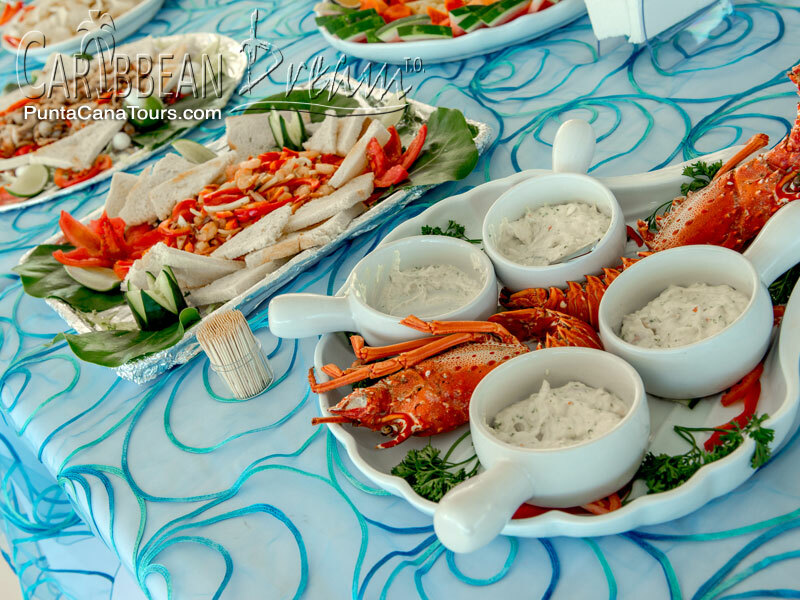 We offer three different private charter options with lunch/dinner, or two snack options. Each option includes national bar, or you can upgrade your excursion with an international bar. 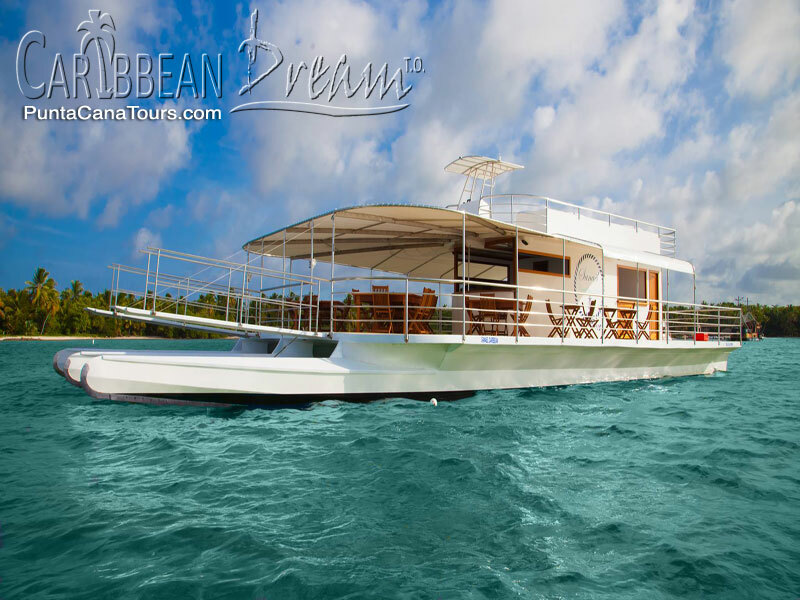 Our charters have a duration of 3 hours and may include a DJ, a slow cruise along the Punta Cana coastline with a stop at a natural swimming pool where your guests can take a dip in these waist-deep waters. 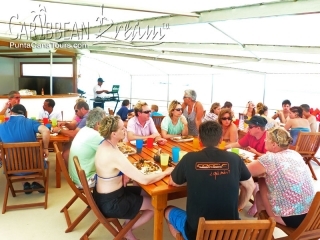 Meals are also served, at sunset, at the natural swimming pool. Our Punta Cana Wedding Boat is perfect for wedding groups, incentive groups or anyone who wishes to experience high end service in an incredibly spacious trimaran. 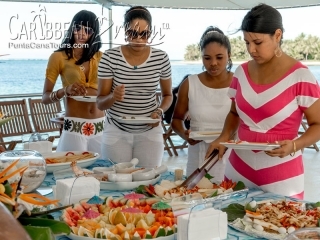 Dominican Snack: Variety of cheese, ham, turkey, tuna, salami and vegetable hors d'oeuvres. Fruit. Tropical Snack: Variety of Cheese, Ham, Turkey, Tuna, Salami, Shrimp, Lobster and Vegetable Hors D'oeuvres. Fruit. Can I charter this boat in the evening? 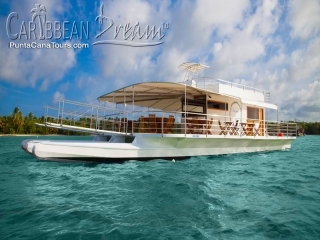 Yes, the wedding boat is one of the only boats in Punta Cana that is allowed to navigate at night. The latest pick up is 8 pm and the boat can stay on the water until 12 am. The standard excursion is 3 hours at sea, so approximately 4 hours with transportation. This tour can be extended additional hours. 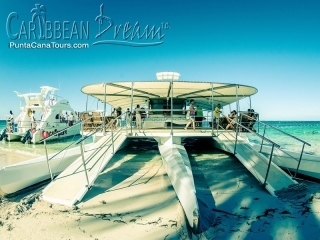 This charter departs from the Beach in front of Jelly Fish Restaurant, which is about 30 minutes from most Bavaro hotels. This boat may pick up on the beach for select hotels. This boat is priced according to the food option, there are 5 different menu options ranging from the Dominican snack to the Mixed Grill. There is also the option to upgrade the bar of beer and rum to include vodka, whiskey, gin, tequila. Does the charter include snorkeling? 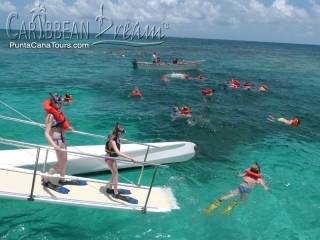 Snorkeling is available on request, for larger groups snorkeling will take place in small rotating groups. There is no snorkeling after 5 pm. Snorkeling equipment is provided. Yes, there isa wedding decorator who can work with you directly to make your vision a reality. You are also welcome to bring your own decorations. Yes, you can bring a USB or an auxiliary chord to play your own music. With any of the grill food options or with 30 or more guests, this charter includes a DJ. 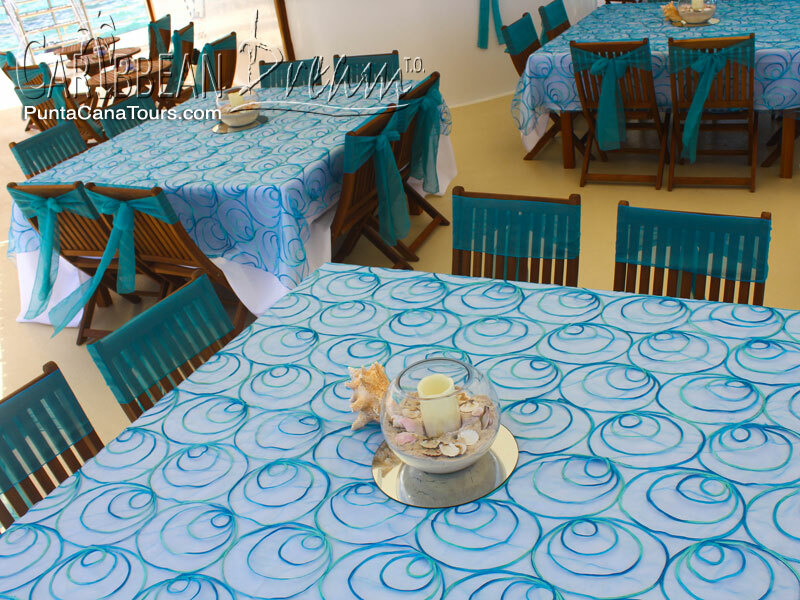 Can we have a ceremony on board or on the beach? Is this boat only for weddings? 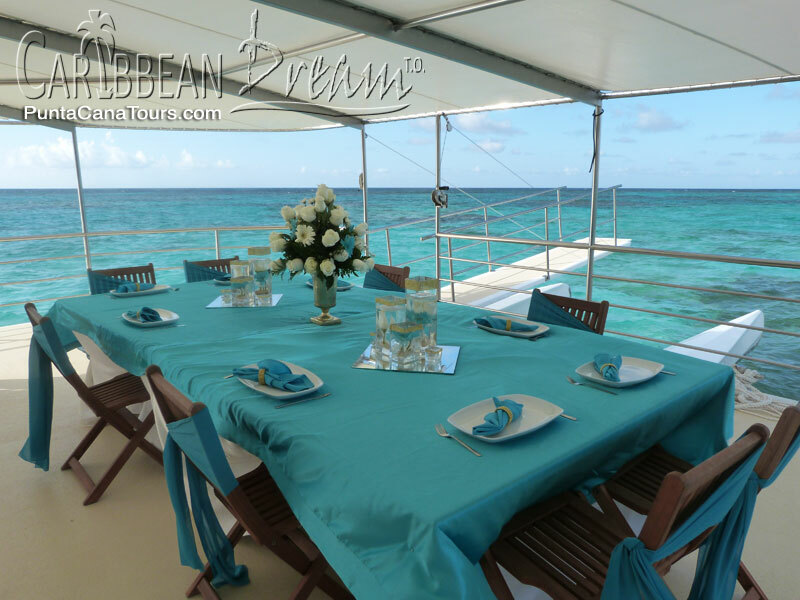 No, you can absolutely charter this boat for other groups that are not wedding groups! 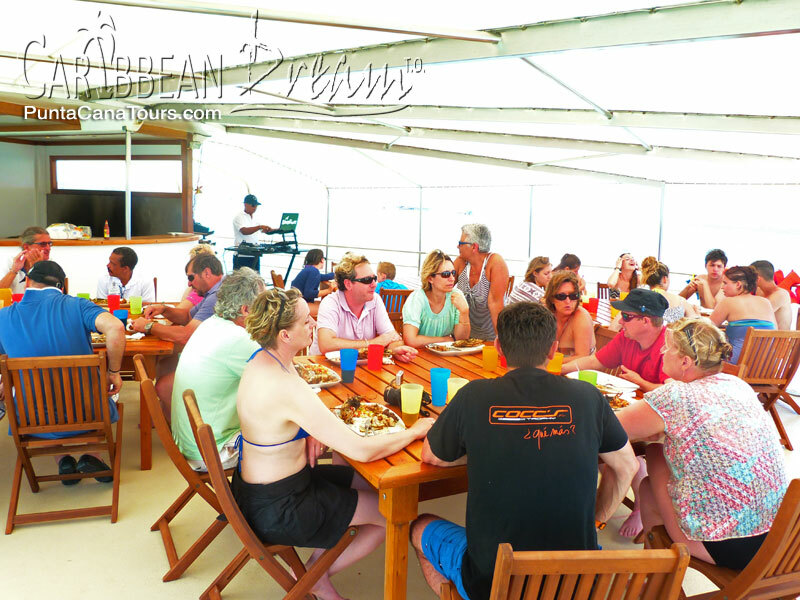 This is a great option for parties of 25 or more, and especially good for really large groups, up to 150 people!